RV Tire Safety: "Danger, Will Robinson, Danger"
I think a good number of us remember those iconic words of warning from B9 the robot on the "Lost in Space" TV show from the 1960's. I repeat it here for I feel that just like young Will, many RV owners simply continue on and do not heed the warning. My message is of the importance of having adequate inflation based on the real tire loads. Without knowing the real load you can't use industry guidelines on how much air you need to have in your tires. Too many RV owners simply and incorrectly assume that if they get on a scale and learn the axle load they can assume they know the tire load because they simply divide by 2 and think the result is the tire load. In reality few motorhomes are balanced side to side and even fewer trailers are balanced between axles so towables tend to be worse off as they start down the wrong path by taking the total load on all the trailer axles and divide by the number of axles and assume equal load distribution. They then compound their error and further assume equal side to side loading. Now these assumptions might be tolerable if there is adequate (12 to 20%) "Reserve Load" ** but most RVs have no room for error and many have so little safety margin that they end up with one or more tires and/or axles overloaded. Recently I did some research on a couple of forums to see if I could learn what the real load balance was. Looking at 14 different Class-A motorhomes I found side to side variation on front axles ranged from 50/50 to 47/53 with no trend showing which side was heavier. The rears ranged from 50/50 to 54/46 but again there was no consistency as to which side was heavier. Here is a detailed breakdown of a group of Class-C motorhomes. So here we see that while a majority seem reasonable balanced in the range of 48/52 or better we do see that some people are out with a split of 45/55 and this is on a vehicle that probably started life very near 50/50 which is what you would expect from a major mfg like GM or Ford. I reviewed over 500 posts to a thread that asked what the "Real Weight" was but only found two owners know the actual tire loads. Searching some other threads I found a very small sample. I found that the best trailer had 50/50 on the front axle and 52/48 on the rear axle. This sounds good until you also look at F-R axle to axle split and find 61/39. If we look at the trailers with 50/50 balance between axles we see some as bad as 41/59 side to side. The only trend I think might exist is that Class-B and smaller Class-C without slideouts might be a bit better for side to side balance than the rest of the RV community. Important note. All of the above is simply looking at balance and not if any tires are overloaded. 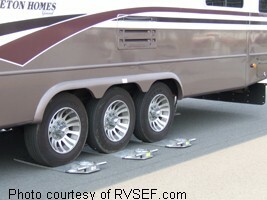 RVSEF has done over 35,000 RVs and recorded the individual tire load measurements. They point out in their seminars they have found some 57% of RV have an overloaded component. While preparing this post I learned from an RV repair company that they find $7,000 worth of damage on motorhomes is normal when there has been a tire failure so clearly making the effort to either get your RV weighed at big RV events or finding a scale where you can get both individual axle loads and one side at a time is worth the effort if you want to avoid this unnecessary expense. If you want additional information on how to get your individual tire loads you can check this site. If you have a facility that can weigh individual axles and one side of the RV at a time you can download a worksheet to help you calculate the individual tire loads. Once you know the actual individual tire loads simply select the load on the heavier side, look up the minimum inflation needed to carry that load and inflate ALL tires on each axle to that level. If you exceed the max for a tire you MUST move stuff around or out of the RV or you can expect to simply be another statistic. 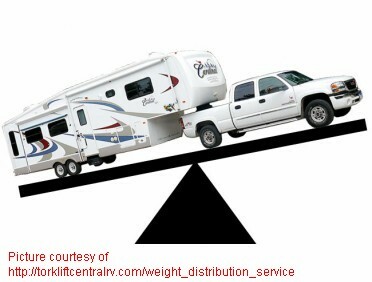 BOTTOM LINE Hopefully I have convinced you that you can't assume the weights on your RV are either balanced or under spec. The odds are that you have one tire carrying at least 5% if not 10% more than another but you can't guess which. ** Reserve Load. The difference between the tire load capability at it's cold inflation pressure and the actual load on that individual tire. Why don't RV tires get recalled?